Easter is around the corner and children’s excitement levels are rising as the time for the famous Easter egg hunt approaches! Adults are also entitled to hidden delights in fresh spring flowers and greens. The Flower Pot’s Bunny Basket embodies everything we love about this holiday and spring season, and is a perfect gift for anyone from one to ninety-two. 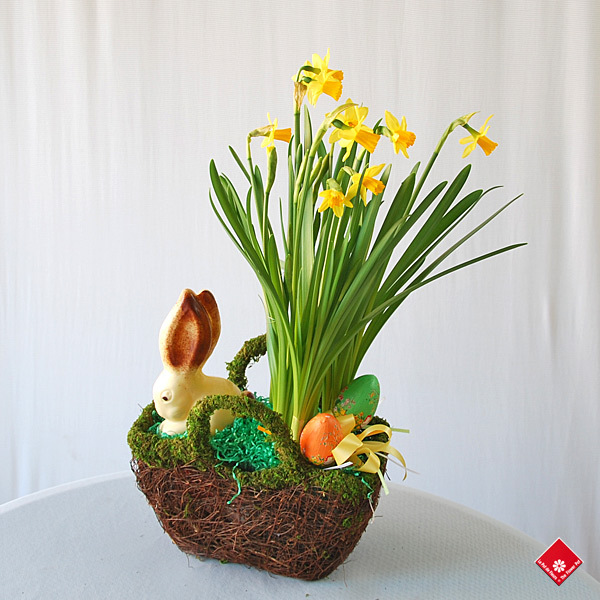 An adorable and delicious milk and white chocolate bunny from Chocolats Privilège peaks out from behind sunny yellow daffodils in an earth themed basket. A couple of decorative Easter eggs and curly willow branches complete the effect. Brighten up your day or someone else’s for $30 by ordering this beautiful basket online on our website www.theflowerpot.com, over the phone (514-938-1234) or at our Downtown Montreal location (1340 Notre Dame O). Happy Easter!